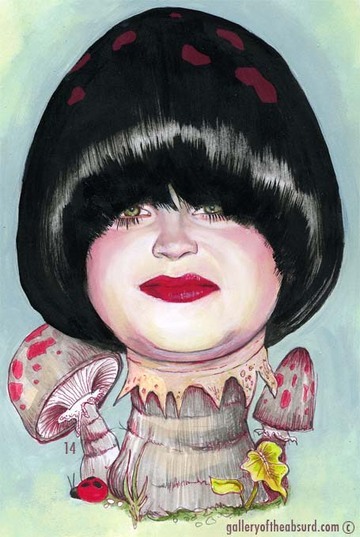 For Kelly Osbourne, every day is Halloween. She's always decked out in wild costumes and dramatic hair styles. She bucks the trend of what most of Hollywood considers "fashionable" and she pays dearly for it. Just about every week, you'll find her tucked in the "Fashion Disasters" and "Hair Traumas" features of the tabloids. Commenting on Kelly's hairstyle seen above, In-Touch magazine screeched, "Kelly looks like she's entering a war zone with that bowl-shaped helmet of hair" and then went on to compare her to Moe from the Three Stooges. When I looked at the picture, I was overcome with the sudden desire to study the field of Mycology. 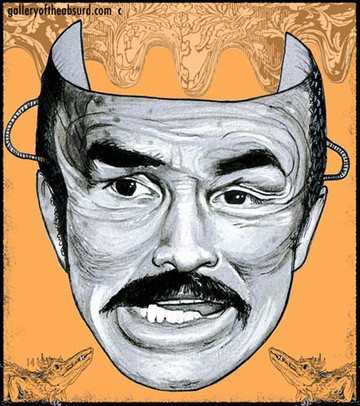 I am a big fan of Burt Reynolds and have enjoyed his box office hits, as well as his flops. 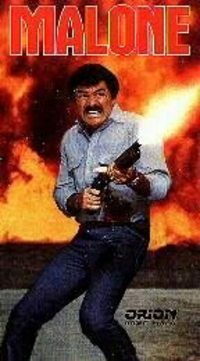 I even own a Malone poster (see below) in which Burt is standing in front of an exploding inferno, firing off a huge machine gun while wearing a jet black toupee. He was aging wonderfully...distinctive, some would say....so WHY WHY WHY did he go and stretch his face out with all that unnecessary plastic surgery?!?!? 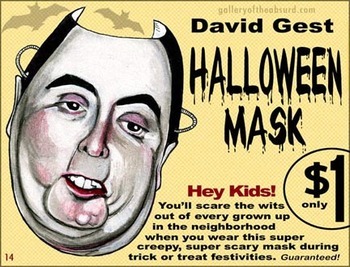 Second in my series of Celebrity Halloween Masks, this Burt Reynolds mask is sure to scare all your friends. To make your costume even MORE disconcerting, wear it while dressed in the leather daddy outfit Burt wore in Deliverance. Yikes. Thank you Karin for the headline idea! 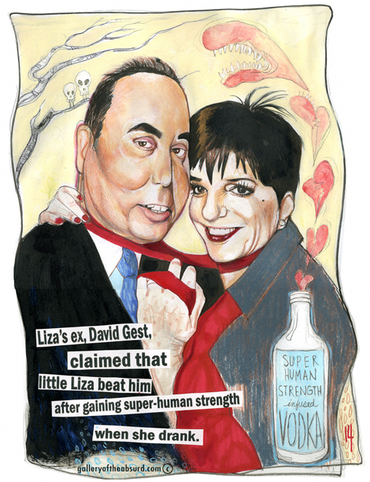 One of my favorite celebrity gossip stories is the one about David Gest claiming Liza Minelli beat him to a pulp after she got drunk and went into a rage. Powder, blush and lipstick-wearing Gest tried to sue tiny little Minelli for $10 million. This painting was inspired by a photograph and story I found in Star Magazine. The headline is actual, and was cut out of the magazine and added to the painting. I'm not too sure about the validity of Gest's claim, but if I woke up next to that thing in my bed, I'd try and swat it away too. SCARY!! !